What can I say? THE CAKE WAS AMAZING!!! Seriously, we had fairly high expectations but you completely blew us away! Your cake was the talking point of the whole wedding, people were wondering at it for days afterwards: it basically stole the show! We were marvelling at the level of detail: incredible! Then there was the cake itself. Our guests were so impressed that it tasted as good as it looked. And after weeks of pre-wedding diet the slice of banoffee cake I had on the day was probably the best thing I’ve ever tasted! Finally, thank you for being such a pleasure to work with. Some of our suppliers really added to the joy and fun of wedding planning and you were certainly one of them. Your friendly, positive attitude was great and we felt like you were excited for us. Just a very quick message to say how eternally grateful both Wes and myself are for our amazing cake. It was the talk of the night and it was a real sadness to cut it at all. 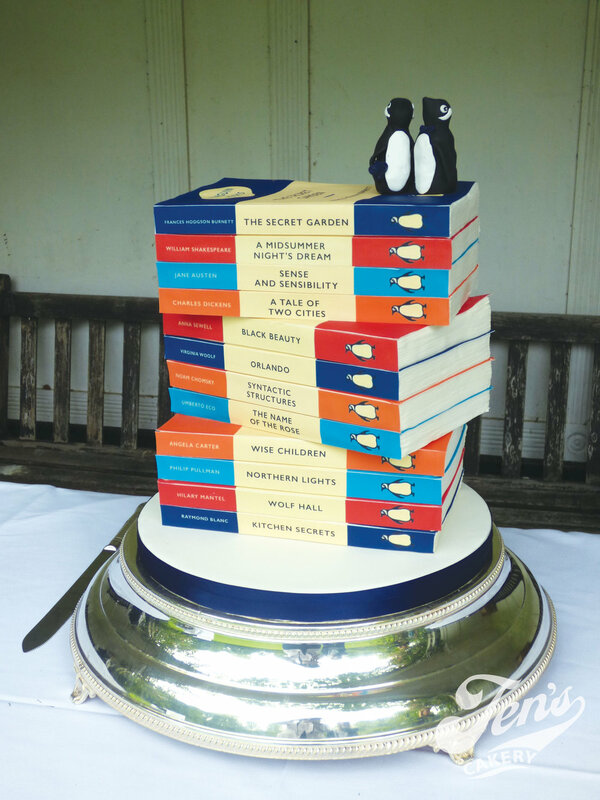 The fimo penguins are sitting on our book shelf - and there are a million photos to remind us; but not only did it look incredible... it tasted incredible too. Thank you. The cake design looked so amazing - it was perfection! Each tier was so tasty & we managed to taste each layer which we set as our mission so not to miss out (we missed most of other food). Thank you so much for making our cake, the colours came out just as we’d imagined and the roses were beautiful. All the flavours went down really well, especially the chocolate and salted caramel! ...and if you want to hear more, check out our google reviews!